I got inspired by Windy Ellard's use of the Hold on to Hope stamp set. When I sat down to recreate her card, this is the card I ended up with--quite different! I used some colors I saw as stage decorating recently: Wisteria Wonder, Basic Gray, Pool Party. The green leaves and flowers are stamped in Pear Pizzazz. I need to use my pearls more often! They are so classy. I like my Easter cards to say, "He is Risen" so I just wrote it on the banner in my own handwriting. I used two colors of Stampin' Write markers to color my banner stamp. Of course it was easily cut out using the Cross of Hope Framelits Dies. Thank you for coming by today to see what I created. Won't you leave me a comment? I love to read them all. 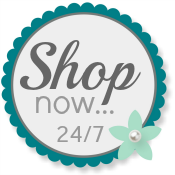 When you are ready to shop for your Stampin' Up! products, I hope you will use my Online Store. What a perfectly beautiful and meaningful Easter card, Patti, Thanks for sharing. Your Easter card is really pretty! I also like the "He is Risen" saying, but I'm not so fond of my handwriting. Your writing actually looks nice on this card, and I agree that the pearl embellishments add a nice little touch. Thanks for your creativity!